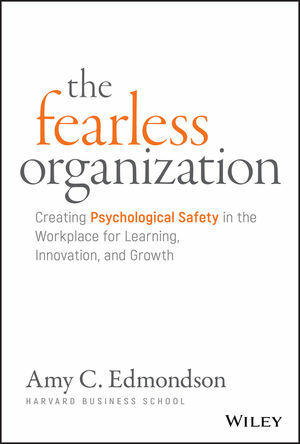 The Fearless Organization: Creating Psychological Safety in the Workplace for Learning, Innovation, and Growth offers practical guidance for teams and organizations who are serious about success in the modern economy. With so much riding on innovation, creativity, and spark, it is essential to attract and retain quality talent—but what good does this talent do if no one is able to speak their mind? The traditional culture of “fitting in” and “going along” spells doom in the knowledge economy. Success requires a continuous influx of new ideas, new challenges, and critical thought, and the interpersonal climate must not suppress, silence, ridicule or intimidate. Not every idea is good, and yes there are stupid questions, and yes dissent can slow things down, but talking through these things is an essential part of the creative process. People must be allowed to voice half-finished thoughts, ask questions from left field, and brainstorm out loud; it creates a culture in which a minor flub or momentary lapse is no big deal, and where actual mistakes are owned and corrected, and where the next left-field idea could be the next big thing. Shed the “yes-men” approach and step into real performance. Fertilize creativity, clarify goals, achieve accountability, redefine leadership, and much more. The Fearless Organization helps you bring about this most critical transformation. AMY C. EDMONDSON is the Novartis Professor of Leadership and Management at the Harvard Business School. Edmondson, recognized by the biannual Thinkers 50 global ranking of management thinkers since 2011, teaches and writes on leadership, teams and organizational learning. Her articles have been published in Harvard Business Review and California Management Review, Administrative Science Quarterly, and the Academy of Management Journal. She is the author of Teaming: How Organizations Learn, Innovate and Compete in the Knowledge Economy and Teaming to Innovate from Jossey-Bass.